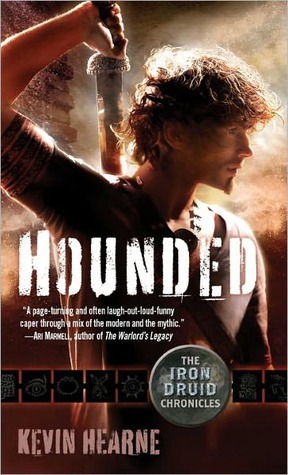 As you can see above, Felicia - Geeky Blogger's Book Blog, Amanda - On A Book Bender, Ash - Smash Attack!, Jen - In The Closet With A Bibliophile and Missie - The Unread Reader are the awesome bloggers that will be hosting this read-along for Hounded By Kevin Hearne. 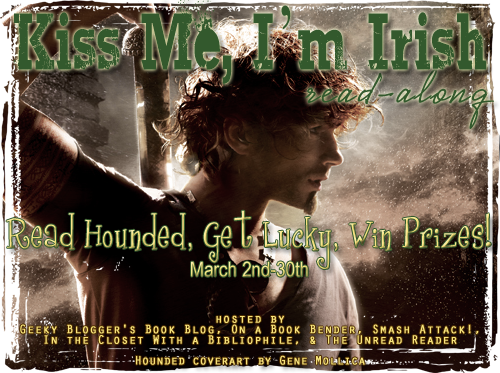 So if you are interested in doing this read-along make sure to visit Felicia's Geeky Blogger's Book Blog and sign up for Kiss Me I'm Irish Read-Along. I am trying to sneak in some visiting today LOL :) PS I loved your book boyfriend this week! Thanks for the heads up from my turtle reading buddy! Thanks for the shout out! Off to sign up right now! BB!!! You are so full of awesome! Thank you for joining us. I'm so happy! Yay.. another round we go. These read-alongs seriously help slim down my TBR pile.